New to Cambridge Bibles: Here is our exclusive Cambridge Information Page. The first Cambridge Bibles in the New Living Translation are presented in the classic Pitt Minion format—widely admired for its combination of a slimline form, good readability and elegant page design. 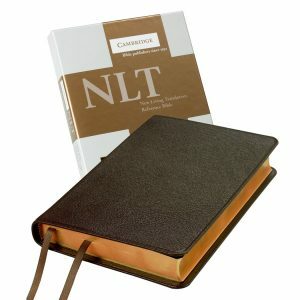 The NLT Pitt Minion Bibles have the features characteristic of the Cambridge Pitt Minion “family”: comprehensive cross-references, a concordance and 15 colour maps to support the Bible text. They are printed on delicate India paper, Smyth-sewn for flexibility and endurance, and bound with ribbon markers and presentation pages. There are two goatskin leather bindings, one black and one brown. Here are evangelicalbible.com’s pic’s.